The migration crisis that began in 2015 has had a major impact on countries in South Eastern Europe. Outlining findings and recommendations from a new project, Amanda Russell Beattie, Gemma Bird, Jelena Obradovic-Wochnik and Patrycja Rozbicka explain that the EU’s response to the crisis has resulted in the outsourcing of refugee settlement and care to states such as Serbia, Greece and Bosnia which were previously described as ‘transit’ countries. This is leading to overcrowding in refugee camps and reception centres, as well as difficulty in ensuring adequate standards of care and accommodation. On 26 February at an event in London, we will be presenting results from a major project responding to the current crisis of refugee support in Greece and Serbia. The results of our project suggest that changes in EU border management have limited refugees’ movement across Europe, and as such, have resulted in the outsourcing of refugee settlement and care to states previously described as ‘transit’ countries along the Balkan Route(s): Serbia, Greece and Bosnia. Following Donald Tusk’s 2016 speech in which he spoke ‘to all potential illegal economic migrants wherever you are from: Do not come to Europe… It is all for nothing. Greece or any other European country will no longer be a transit country’, his intention had been to reduce the numbers of refugees along the route. However, whilst the number of refugees arriving into the countries of South Eastern Europe has decreased overall since 2015, the flow of people nevertheless continues, with 139,300 arriving via the Mediterranean Route in 2018 according to the UNHCR. Importantly, new arrivals are not able to transit through South Eastern Europe and are increasingly getting ‘stuck’ in transit countries, which is leading to overcrowding in refugee camps and reception centres and limited resources to ensure standards of care and adequate accommodation. Our report analyses the problems related to refugee support services and accommodation in these countries and along the Balkan Routes towards Western Europe. It highlights the disparity of refugee services, housing and living conditions across the region, and acute and ongoing humanitarian crises. There are several key factors affecting poor living conditions for refugees, including: overcrowding, fragmentation of services along the routes, and a lack of consistency in camp management. Subsequently, there are a range of other refugee housing options existing in transit countries: including informal and makeshift camps, squats, hotels and UN-supported housing schemes known as ‘urban shelters’, each with their own strengths and weaknesses. There are six key conclusions from our project. First, we found that population size and levels of overcrowding are one of the fundamental factors affecting provision and quality of life in all types of refugee housing. Mainland camps, as well as, informal housing provision such as squats, are able to control the number of residents they have whereas island reception centres have far less control and as such are overcrowded with people stuck in these spaces for as long as 18 months. Second, relationships between camps, reception centres and third sector provision plays a key role in determining access to healthcare, sanitation, psycho-social support and community spaces and whether these are provided inside or outside of accommodation spaces. In areas where the relationship between camps and NGOs is good, refugees can benefit from women and children centres, language lessons, healthcare, laundry, clothes distribution and improved shower facilities within the boundaries of the camp. In areas where this relationship is less co-operative these services can only be accessed outside of reception centres and often less frequently. Third, lack of clarity and transparency surrounding asylum procedures leads to an increased anxiety about the process. A lack of knowledge about how the process works, what happens at each stage, and what each decision means, leads to refugees, particularly unaccompanied minors, breaking rules that they did not realise were in place, making them more vulnerable. Fourth, different forms of housing support are dependent on individual circumstances; however, there is a lack of flexibility, particularly surrounding vulnerable cases where a ‘one size fits all’ approach is not suitable. In cases where people have suffered trauma moving them out of camps and into apartments seems like the best solution. Yet for some people sharing apartments with other equally traumatised people can make the situation worse rather than better. Fifth, refugees are driven towards informal housing such as squats and makeshift settlements for two main reasons: poor camp conditions or overcrowding, and uncertainty over the asylum process, including long waits for asylum interviews in Greece. Improving both the conditions of formal housing provision and the transparency of the asylum process will help to reduce reliance on activists and voluntary organisations to provide informal housing. Finally, there is a lack of formal support for people living in informal accommodation, particularly healthcare, food and sanitation. Whilst informal housing is still used by refugees, with some squats even declaring themselves full and relying on a waiting list, greater recognition is needed for these forms of accommodation to ensure refugees still have access to healthcare that would normally require an address to register for. We have five recommendations for policy change. First, there is an urgent need to manage the numbers of people living in the island reception centres by increasing the number of transfers to mainland Greece or elsewhere in Europe and improving mainland living conditions and provision. Second, greater transparency and increased dialogue between some reception centres and third sector provision is required. Third, there should be an urgent increase in capacity to process asylum registrations in Greece and thus reduce current waiting times and overcrowding in reception centres. More, and better quality information for refugees about each stage, predicted waiting times and what each stage means is needed in the early stages of the asylum process to reduce anxiety for people living in reception centres. Fourth, greater flexibility is required in the provision of housing, especially for vulnerable cases where the needs of individuals differ greatly. To achieve this, greater resources are necessary. Finally, there is a need for increased funding and support for the UN ESTIA ‘Urban Shelter’ scheme which transfers refugees from camps and settles them in apartments, as well as increased capacity of non-camp housing, and creation of incentives for local authorities reluctant to cooperate with the scheme. Our recent visits to Athens and Samos have reiterated the need for these changes. 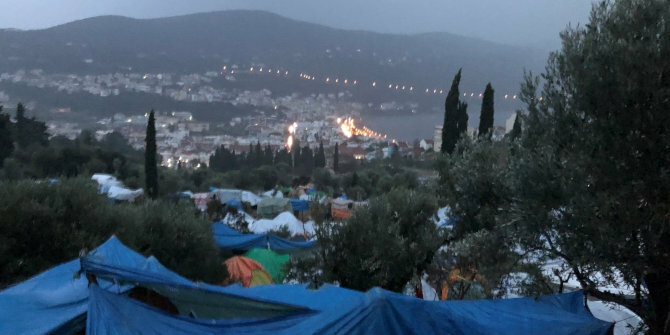 The Reception Centre on Samos has an official capacity of 700 people, yet between December 2018 and January 2019 an estimated 5,000 people were waiting on the island for an asylum decision. Such overcrowding leads to long queues for food, for showers, for laundry facilities and for legal information and support, as well as increased risks of gender based violence, sickness and trauma. Squats and informal housing providers in Athens are also now forced to declare themselves full with limited space available to house people and one squat talking about a waiting list of over 400 people. South Eastern Europe is witnessing an ongoing crisis, a crisis of support and provision. The authors of this article are part of the IR_Aesthetics project which, in collaboration with The Foreign Policy Centre, will be presenting a report at Portcullis House in London on 26 February responding to the current crisis of refugee support in Greece and Serbia, and making key suggestions for change based on field research carried out in the region between 2017-2019. Amanda Russell Beattie is a Senior Lecturer in Politics and International Relations at Aston University. Jelena Obradovic-Wochnik is Deputy Director of the Aston Centre for Europe and an expert in the politics of the Western Balkans, Serbia and Kosovo.